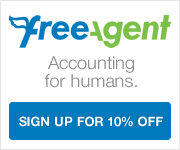 Basically, this is an unprompted post just to say I love FreeAgent. FreeAgent, as many of you will already know, is a setup/bit of software designed to help small businesses and freelancers like me with invoicing, making estimates, organising clients and all that normal business jazz. I just want to tell you that I reckon it’s a good’un and worth considering if you are running your own things business-stylee. I’m not a huge fan of the ‘productivity’ genre (so beautifully commercialized by Apple on the app store), so a piece of software to ‘help me with my business workflow’ filled me with suspicion and fear of being over-run with ‘things I needed to setup’ before the chosen piece of software actually began to do me any good. However, this web app. actually helps with stuff. Stuff that I had never considered, like how long it actually takes to edit an invoice (even when I had a template), tailor it specifically to my client, export it as a pdf, re-edit it for any mistakes or client amendments and send it via email (not to mention actually keeping track of them all…and there are a lot of them). This goes for estimates, quotes (there’s a difference I’ve discovered), tax returns (that it helps with), online banking, contact details and funky little graphics and graphs that make you feel like you’re actually progressing as a business. I have to unreservedly say it’s saved me hours of admin, and I can’t recommend it highly enough. I’m sure there are other alternatives, but this one is dope. I now use this with TeuxDeux (a ridiculously simple todo list web app), and I feel like I’m pretty much on top of businessy stuff, meaning I can get on with the actual work (or blog). It’s worth considering that it costs about £15 a month (£13 if you click the link below), but I absolutely guarantee that 5 invoices and estimates later, and you would have saved that money back in time not spent faffing with unnecessary businessy stuff.